This cherry lemonade combines fresh summery flavors into a perfect warm-weather blended drink - try it at your next summer barbecue! So…this is the third week in a row that the only blogging I’ve done is the Thirsty Thursday post. Sorry about that, guys…things have been busy, and I’ve been tired and under-motivated. I’ve got a bunch of awesome, non-drink posts in the queue though, I promise! For now, lets talk about today’s post. 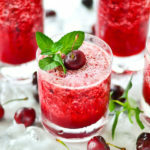 Today’s recipe is inspired by two posts I saw last week – the sparkling cherry lemonade from Damn Delicious, and the frozen blackberry basil lemonade from The Kitchen McCabe. I was intrigued by the idea of a cherry-flavored lemonade, and the Kitchen McCabe’s frozen lemonade just looked so frosty and refreshing…so I combined them! First things first – (1) cherry lemonade is delicious, (2) frozen lemonade is the greatest idea ever, and (3) this frozen cherry lemonade may now be my new favorite non-alcoholic beverage. Now that we have that out of the way, lets talk about things I’m going to do better next time. 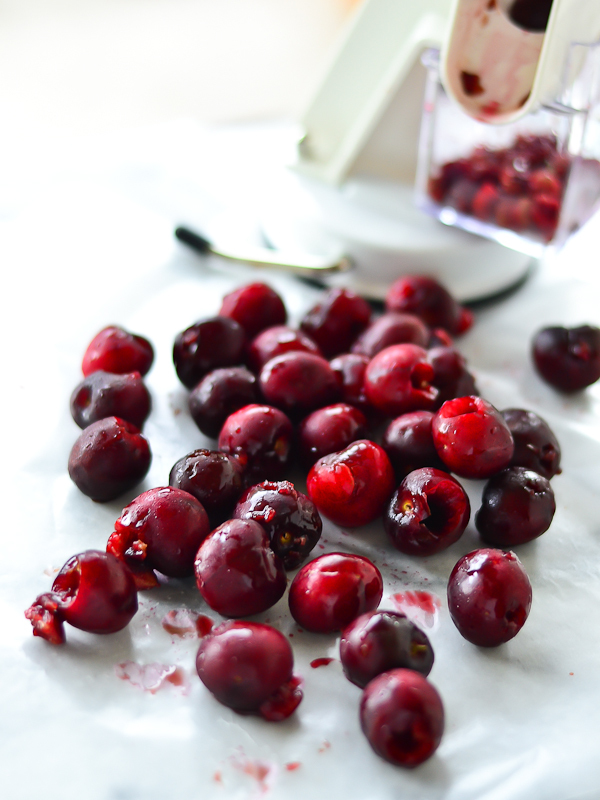 I’m definitely going to use more cherries next time, so that the flavor is more pronounced. And the cherries will be frozen, so that I can use less ice to achieve the blended-drink consistency I prefer – that way the mixture will be a lot more smooth, and there will be less liquid-ice separation. I might also use a mint-infused simple syrup, because why not? These remind me of a cucumber-lime cooler I had once – super yummy and refreshing. Who needs healthy green smoothies when you can have tropical smoothies! I should drink more of these, ASAP. Love love love me a mango lassi, but this strawberry lassi looks even better! Orangecello…it’s like limoncello, but orange flavored – why didn’t I think of that??? Can someone tell me what a gimlet is? Actually, nevermind – all I need to know is that it’s a fun sounding word, and that this lemon-basil version looks delish. Blend on high until mixture is smooth, and desired consistency is achieved. This entry was posted in Beverages, Recipes and tagged autoimmune disease, celiac, celiac health, food allergies, g-free diet, G-Free Foodie, gluten allergy, gluten free, gluten free beverages, gluten free diet, gluten free dining, gluten free drinks, gluten free food, gluten free health, gluten free mommy, gluten free parenting, gluten free snacks. Bookmark the permalink.